Seems like Kai has the right idea. Twin Dragons will continue to update with one page every week. 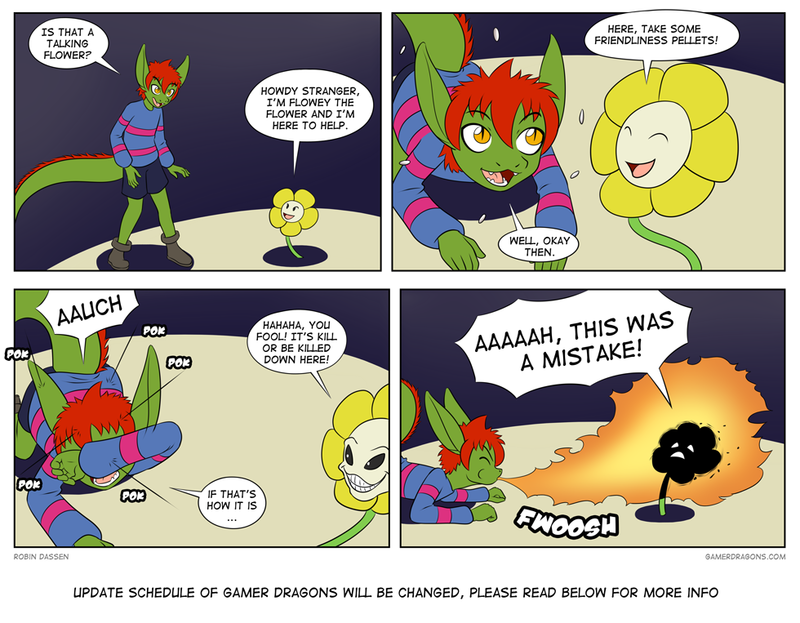 Gamer Dragons will update with at least one page every month. This should ensure that I have enough time to update without fail. I will have to see how it goes with the new job, maybe I can update more than this, but I can’t say for now. This will also keep me from being burned out since I still have some free time to relax as well. It wasn’t an easy decision to make. It pains me to do so, but life happened and I need to. I hope you understand. Thanks. He must be playing blind. The best part of the game goes down the pacifist path I think. Then again, plenty of us think flowey was a creepy jerk. It kinda does. Once you get *spoiler* to low health and *spoiler* kills him, you just have to reload. You don’t have to restart the game. Correction: After that happens and you defeat the final boss. Flowey would pretty much give the opposite reaction than is shown here, but content I guess. I just didn’t get around to replying on your comment yet.